The main archaeological interest in Listowel is provided by the ruins of Listowel Castle while the main architectural interests are provided by the work of the local plasterer and builder Pat McAuliffe (1846-1921), whose stucco artwork decorates many of the façades of the townhouses and shops in the town. McAuliffe’s best-known work in Listowel is, perhaps, ‘The Maid of Erin,’ depicting a romantic image of Mother Ireland surrounded by a harp, a wolfhound and other symbols of Ireland. 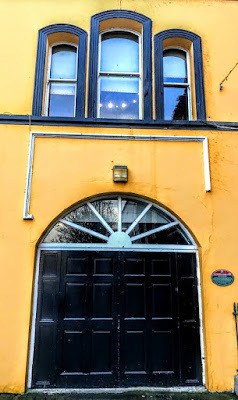 But just a few steps away, on this side of The Square, the Listowel Arms Hotel is an interesting former coaching house that is part of the architectural and social history of Listowel. This is a terraced, five-bay three-storey hotel, built mainly around 1820, with a round-headed door opening to centre. It was extended to the south-west around 1910, with a single-bay two-storey wing at right angles and with a square-headed integral carriage arch at the ground floor. The hotel was renovated around 1920, with render façade enrichments. It was extended to the rear around 1975, with a four-bay three-storey flat-roofed return, and it was extended again in 1998, with the addition of a 19-bay two-storey and three-storey wing over a raised basement wing. A section of the cast-iron railings date from around 1820. 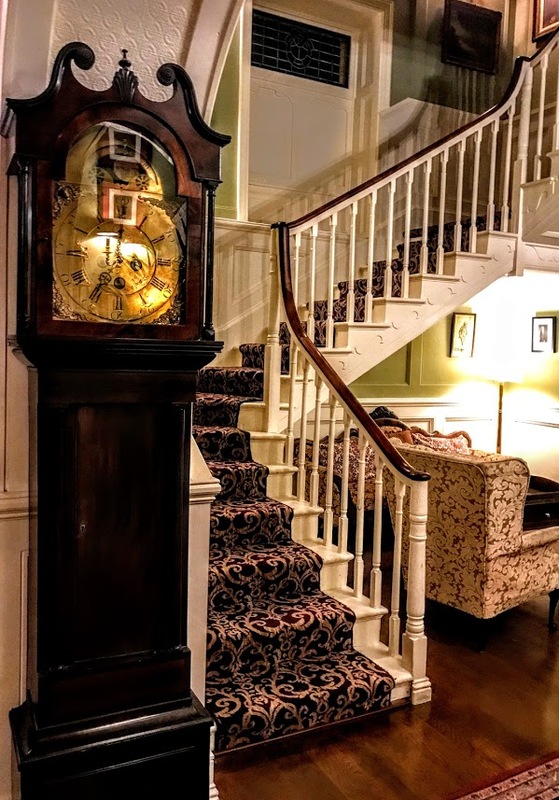 The Listowel Arms is one of the best-known hotels in north Kerry and despite its Georgian appearance this landmark hotel has a story in inn-keeping that dates back to the late 17th century. 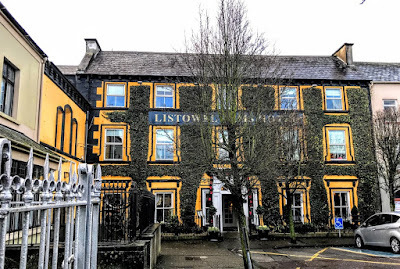 By the early 19th century, the Listowel Arms was owned and operated as an inn by John Leonard until 1824, when he leased it to a man named Adams. Daniel O’Connell was a regular guest refers to it in his writings in the 1820s. He gave one of his rousing speeches from a first-floor window overlooking the Square. 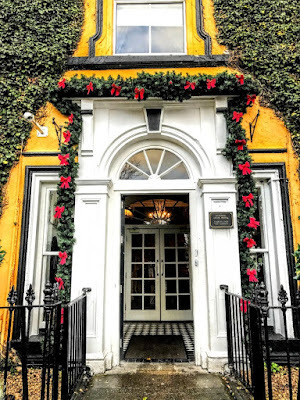 The Victorian writer William Makepeace Thackeray visited Listowel in the 1840s, and recommended the hotel in 1843 in his Irish Sketchbook. Meanwhile, Adams had an only a daughter who took over running the inn in the 1850s with her husband, McElligott. McElligott rebuilt the premises, and added to parts of the building, and the McElligott family ran the inn for most of the rest of the 19th century. The road continued dull and uninteresting, or at least the heavy rain made it appear so. Listowel is the first stage, a town on the Feal [sic], having a handsome bridge over that river. It is rather remarkably situated upon a steep eminence, rising on a sudden from a wide-extended flat; and the remains of an old castle frowning over the brow of the height give it a striking appearance in approaching it. This castle once extended a considerable way; the principal part that remains is a gateway, a lofty circular arch, between two lofty round-towers. From hence we proceeded to Glynn on the Shannon, where were to be our night quarters. For a long way beyond Listowel there is a dismal dreary bog without an object of any kind to excite interest. Parnell died within a month in Hove on 6 October 1891. 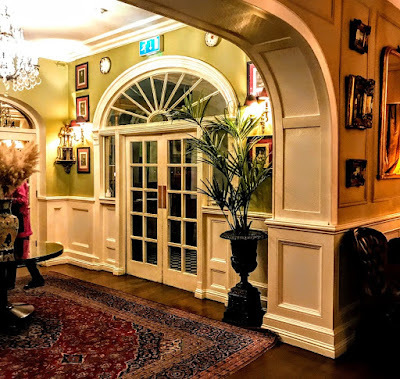 The Listowel Arms had many owners in the 20th century, including the singer Joseph Locke, who was here for three or four years in the 1960s and changed the name of the hotel to the White Horse. Later, the hotel was owned for a while by three Listowel businessmen. It was then bought by the Ryan family, hoteliers from Limerick. They owned the hotel for about three years. 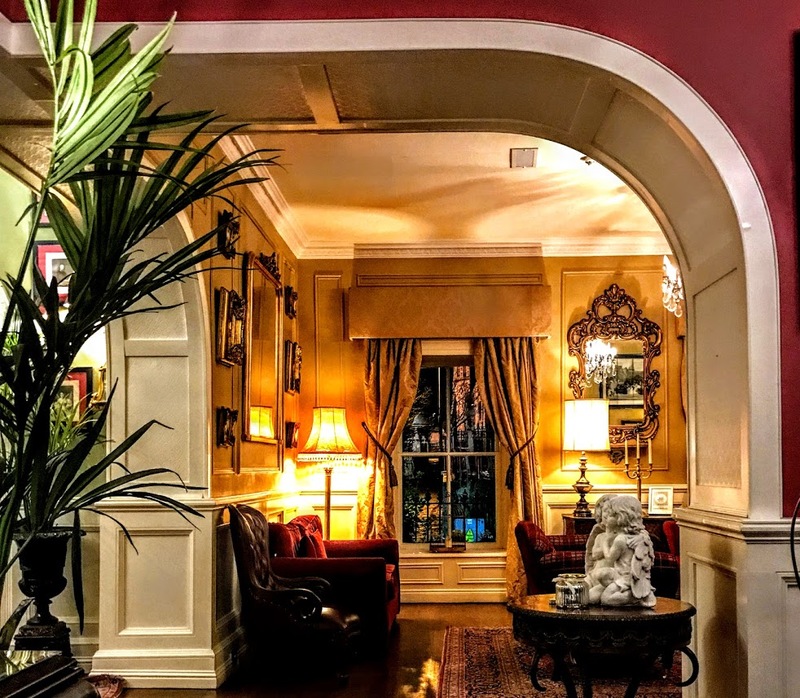 In 1995, it was bought by the Bernard and Josephine O’Callaghan family. Earlier, Bernard O’Callaghan had built and developed the Cliff Hotel and restaurant in Ballybunion in 1960. A one-time Kerry footballer, he grew up in Moyvane, five miles outside Listowel, and married Josephine Ahern from Ballylongford in north Kerry. 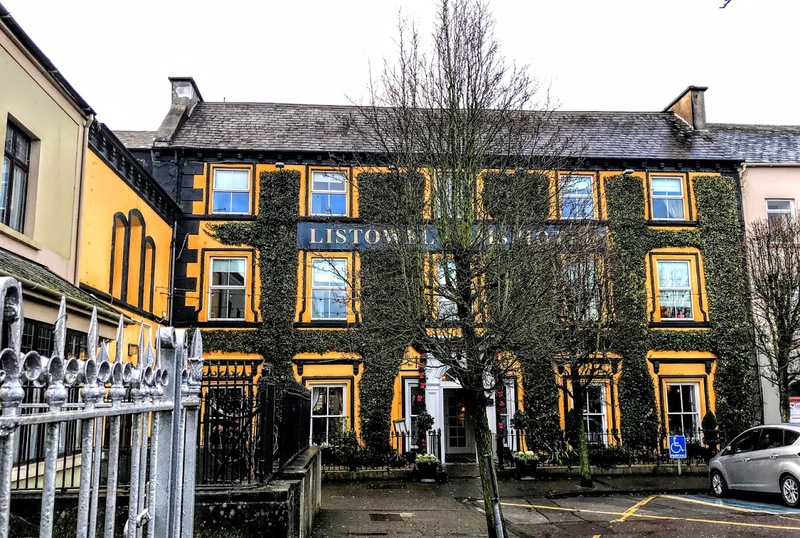 He had an affection and enthusiasm for the Listowel Arms and, managed to buy it on his second attempt to buy it from the Ryan family in 1995. Bernard O’Callaghan died in 1998, but had passed on his enthusiasm to his family. The Listowel Arms was then run by his daughter Patrice, and her husband Graham Gleasure. Her brothers Kevin, Colm and Brian O’Callaghan are also involved in the business. 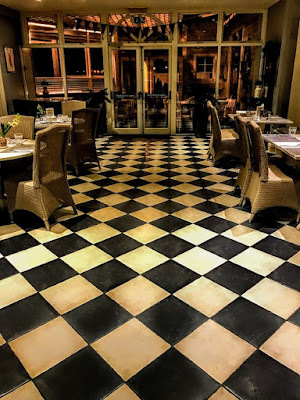 Their work since 1995 has rectified the 1970s decor, unearthed original features and brought the building back to its old, original style. They have reinstated for timber floors, added 12 bedrooms and added the restaurant, function rooms and conservatory overlooking the River Feale Room and designed a new reception area. 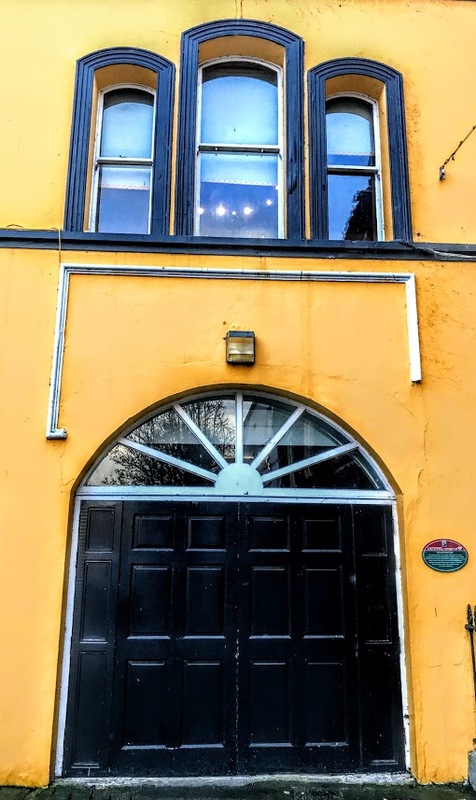 A plaque on the wall is a reminder of the eventful history of the Listowel Arms and the place of this hotel in the heritage of Listowel.